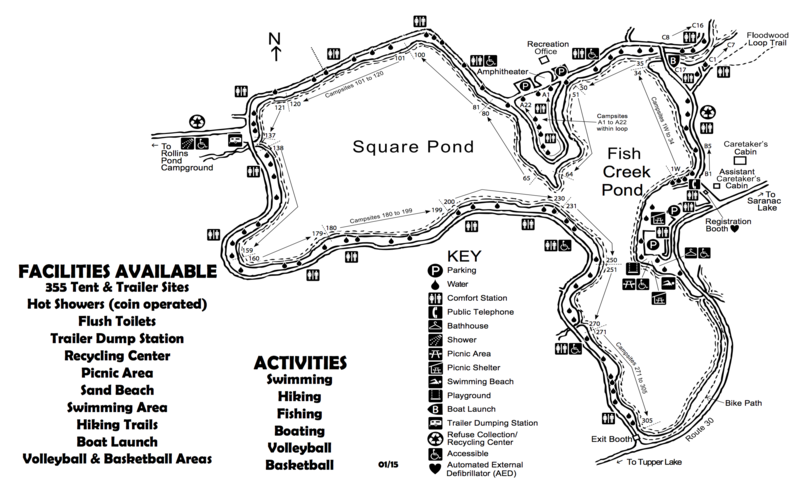 Fish Creek Pond Campground is highly regarded as one of the best Adirondack state campgrounds. There is a natural sand shoreline and water access for most campsites, and is accessible to both motorized and non-motorized boats. Enjoy an Interpreter Activity Program, canoeing and boating, fishing, hiking, and bicycling. Boat launch, hiking trails, volleyball and basketball areas. Recreation activities program from July until Labor Day. Day use, camping, picnic pads, grills, picnic tables, camping pads, showers, rest rooms, pavilion, fishing pier. This is a popular campground, so book early! It is built around a natural sand shoreline that connects Square Pond and Fish Pond. It also connects with Rollins Pond State Campground and allows motorized and non-motorized boating, with a boat launch. The organized recreation activity program is especially fun for kids. It happens daily at the amphitheater, which includes nature hikes, crafts, games, and live entertainment. Hiking trails right at the campground, such as Otter Hollow Loop and Floodwood Loop. Read the blog about camping in Fish Creek, Camping in the Saranac Lake Area!